Rugby refers to the team sports rugby league and rugby union, but generally refers to rugby union due to its popularity throughout the globe. Legend claims that rugby football was started about 1845 in Rugby School, Rugby, Warwickshire, England, although forms of football in which the ball was carried and tossed date to medieval times. Rugby eventually split into two sports in 1895 when twenty-one amateur clubs split from the original Rugby Football Union, to form the Northern Rugby Football Union (NRFU)/Northern Union (later to be named rugby league in 1922) in the George Hotel, Huddersfield, Northern England over broken-time payments to players who took time off work due to the nature of the sport, thus making rugby league the first code to turn professional and pay players, rugby union turned fully professional in 1995.Both sports are run by their respective world governing bodies World Rugby (rugby union) and the Rugby League International Federation (rugby league). Rugby football was one of many versions of football played at English public schools in the 19th century. Although rugby league initially used rugby union rules, they are now wholly separate sports. In addition to these two codes, both American and Canadian football evolved from rugby football. Following the 1895 split in rugby football, the two forms rugby league and rugby union differed in administration only. Soon the rules of rugby league were modified, resulting in two distinctly different forms of rugby. After 100 years, in 1995 rugby union joined rugby league and most other forms of football as an openly professional sport. The Greeks and Romans are known to have played many ball games, some of which involved the use of the feet. The Roman game harpastum is believed to have been adapted from a Greek team game known as "ἐπίσκυρος" (Episkyros) or "φαινίνδα" (phaininda), which is mentioned by a Greek playwright, Antiphanes (388–311 BC) and later referred to by the Christian theologian Clement of Alexandria (c.150-c.215 AD). These games appear to have resembled rugby football. The Roman politician Cicero (106–42 BC) describes the case of a man who was killed whilst having a shave when a ball was kicked into a barber's shop. Roman ball games already knew the air-filled ball, the follis. 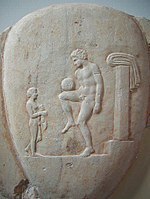 Episkyros is recognised as an early form of football by FIFA. In 1871, English clubs met to form the Rugby Football Union (RFU). In 1892, after charges of professionalism (compensation of team members) were made against some clubs for paying players for missing work, the Northern Rugby Football Union, usually called the Northern Union (NU), was formed. The existing rugby union authorities responded by issuing sanctions against the clubs, players, and officials involved in the new organization. After the schism, the separate clubs were named "rugby league" and "rugby union". 1100–1800 Many different types of football are played throughout Britain. 1830 Running with the ball became common in 1830s at Rugby School and Rugby School football became popular throughout the UK in the 1850s, and 1860s. 1845 First written code of rules adopted at Rugby School. 1861 The Montevideo Cricket Club is founded in Montevideo, Uruguay. The first club to play rugby outside the British Islands. 1863 The Football Association (FA) is formed, formalising the schism between association football and rugby football. 1864 The first rugby clubs are formed, followed by hundreds more in Cumberland, Lancashire and Yorkshire in the 1870s, and 1880s. 1865 The British Army plays a game of rugby against civilians in Montreal, introducing rugby to the country. This movement would later evolve into Canadian football. 1871 The Rugby Football Union is founded, following a meeting of 25 clubs at the Pall Mall restaurant. 1871 First recognised international rugby match, played between England and Scotland. 1876 Matthew Bloxam's letter is published in The Meteor. It claims William Webb Ellis, a pupil at Rugby School, picked up the ball and invented rugby. Although a Rugby Football Union inquiry in 1895 found no actual proof, it decided to perpetuate the myth. 1877 The number of players is reduced from 20 to 15 a side. 1880 English Rugby rules required for a tackled player, when the ball was "fairly held", to put the ball down immediately for scrummage. Walter Camp proposed at the US College Football 1880 rules convention that the contested scrummage be replaced with a "line of scrimmage" where the team with the ball started with uncontested possession. This change effectively started the evolution of the modern game of American football away from its rugby origins. 1883 First Home Nations Championship between England, Ireland, Scotland and Wales. 1886 Concerned at the growing dominance of the largely working-class northern clubs, the Rugby Football Union introduces strict amateur rules: no one was allowed to seek or receive payment or other material reward for taking part in the game. 1888 New Zealand Native football team tours Britain, Australia and New Zealand in 1888 and 1889. 1890 Modern points scoring is uniformly accepted by the Home Nations for the 1890–91 season. 1892 Charges of professionalism are laid against rugby football clubs in Bradford and Leeds, after they compensated players for missing work. This was despite the fact that the Rugby Football Union (RFU) was allowing other players to be paid, such as the 1888 British Isles team that toured Australasia, and the account of Harry Hamill of his payments to represent New South Wales (NSW) against England in 1904. 1893 Yorkshire clubs propose allowing players to be paid six shillings ‘broken-time’ payments when they miss work due to matches. RFU votes down proposal. Widespread suspensions of northern clubs and players begin. 1895 The Schism in rugby football results in the formation of the Northern Rugby Football Union (NRFU). Many factors played a part in the split, including the success of working class northern teams, a decree by the RFU banning the playing of rugby at grounds where entrance fees were charged, threat of expulsion from the RFU if clubs cannot prove their amateurism, and the banning of "broken time payments" to players who had taken time off work to play rugby. Twenty-two clubs met at the George Hotel, Huddersfield and formed the "Northern Rugby Football Union". Within fifteen years of that first meeting in Huddersfield, more than 200 RFU clubs had left to join the Northern Union. 1897 To make the game more exciting, the Northern Union abolishes the line-out and reduces value of all goals to two points. Line outs were replaced with punting the ball back into play from the touch-line. Tries worth three points. 1897 The Challenge Cup is established and proves a success from the start. Batley became the first winners, beating Saint Helens 10–3. 1898 Professionalism is introduced in the Northern Union. The professionalism is strictly part-time, with players obliged to have other "proper" jobs. 1900 Rugby union features at the 1900 Olympics. It finishes in the 1924 Olympics. 1904 First rugby league international match. England lose to Other Nationalities 3–9, at Wigan. 1905 Wales narrowly beat The Original All Blacks, in what was dubbed as "The Game of the Century". 1906 England play South Africa (known as the Springboks) in rugby union for the first time. James Peters is withdrawn from the England squad after the South Africans objected to playing against a black player. 1906 James Peters becomes the first black person to play rugby union for England, against Scotland. 1906 In the Northern Union the number of players is reduced from fifteen to thirteen a side, in order to allow more room for creative play. The early form of play-the-ball is introduced as the game's way of restarting play after a tackle. 1907 A New Zealand professional rugby team tours Britain. Albert Henry Baskerville, a Post Office clerk in New Zealand, organises a touring side branded the ‘All Golds’ in Sydney due to the players receiving a share of any profits from the tour. They play under rugby union rules in Sydney. On their way to Britain, Australia's greatest player, Dally Messenger, joins them on tour. They win the game's first test series 2–1, but Baskerville dies of pneumonia on the way home at the age of 25. 1907 Rugby league spreads to Australia and New Zealand. The New South Wales Rugby Football League is founded at Bateman's Hotel in Sydney. The New South Wales Rugby League sets up an eight-team competition after a row with the New South Wales Rugby Union over compensation for injured players. The first Premiership is won by South Sydney. Rugby league goes on to displace rugby union as the primary football code in New South Wales and Queensland. 1908 The first Australian Kangaroo tourists visit Britain. Hunslet become the first club to win all four trophies available to them; the Championship, the Challenge Cup, the Yorkshire Cup and the Yorkshire League. Hunslet were led by Albert Goldthorpe, a dominant figure in the early years of the code. 1910 The Rugby Union Home Nations Championship becomes the Five Nations Championship when France joins. 1910 The first Northern Union British Lions tour Australia and New Zealand, winning the test matches in Sydney, Brisbane and Auckland. 1912 South African rugby union tour of the British Isles and France. The tourists achieved a "Grand Slam" of victories over all five major European teams, England, Ireland, Scotland, Wales and France. 1914 British tourists defeat Australia 14–6 to win Ashes in final test, finishing with only ten men in what becomes known as ‘Rorke’s Drift’ Test match. Proposals are made and preliminary steps taken in Australia to amalgamate the rules of rugby league with Australian rules football – Australia's dominant football code outside New South Wales and Queensland – to form a universal football code for the country, but efforts to that end subside as World War I escalates, and are never seriously revived. 1922 Northern Union changes its name to the Rugby Football League, the name used for the sport in Australia. 1925 All Blacks Rugby Union tour of Britain, France, and Canada. The New Zealanders remained undefeated throughout the tour, earning the title "The Invincibles". 1929 First rugby league Challenge Cup Final is played at Wembley. Wigan defeat Dewsbury 13–2 in front of 41,500. 1930 Rugby union's European Cup starts, outside the Five Nations. It is interrupted by WWII. 1930 Unprecedented fourth rugby league test match played between Britain and Australia at Rochdale after third test is drawn 0–0. Britain win the test 3–0 to take the Ashes. 1932 First rugby league match under floodlights. 1933 On New Year's Eve, England and Australia play in Paris — the first game of rugby league in France. The French had been excluded from the rugby union Five Nations competition amid allegations of professionalism, so the country was receptive to the new game. 1934 Rugby league is established in France by Jean Galia, a former rugby union international and champion boxer. By 1939, the French league has 225 clubs. 1941 The French Vichy government bans rugby league, because of its links with the Allies and a desire to ban all professional sports. The code's funds and property are all confiscated or passed to rugby union clubs. Rugby union is allowed to carry on unscathed and regains much of the ground it had lost to rugby league. To this day, the rugby league clubs' assets have never been returned to them. 1943 A Northern Command army rugby league side defeats a Northern Command rugby union side 18–11 at Headingley playing rugby union rules. The following year a Combined Services rugby league side beats a Combined Services rugby union side 15–10. These are the only league vs union matches played until 1996. 1944 With the fall of the Vichy Government, the French ban on rugby league is lifted. 1945 Brian Bevan makes his rugby league debut for Warrington. Over the next 16 seasons he scored 740 tries for the club in 620 games. His career total was 796, more than 200 ahead of his nearest rival. 1946 The Lance Todd Trophy first presented to Challenge Cup final Man of the match. Wakefield's Billy Stott is first winner. Lance Todd, killed in a car accident in 1942, was a 1907 New Zealand tourist who managed Salford from 1928–40. 1946 The most famous rugby league tour of all, as the Lions sail to Australia on HMS Indomitable, stoking the boilers to keep fit. After a five-day train journey across Australia, Gus Risman’s team retain the Ashes, drawing one and winning two Tests. 1949 The French Rugby League is banned from using ‘rugby’ in its name. Changes its name to Jeu à Treize (Game of Thirteen). 1951 The South American Rugby Championship commences. 1951 The South African Rugby Union tour the British Isles and France. South Africa achieved a second five-nation Grand Slam. 1951 Just a decade after being wound up, France win their first rugby league series in Australia. They repeat the feat by winning again in 1955. 1951 Rugby league's Cec Thompson becomes the first black player to represent Great Britain in any sport. 1952 Rugby union's European Cup restarts. 1954 102,569 spectators watch the 1953–54 rugby league Challenge Cup final at Bradford, setting a new record for attendance at a rugby football match of either code. 1954 First Rugby League World Cup, the first for either code of rugby, staged in France. Great Britain beat France 16–12 in final at Parc des Princes, Paris. 1956 Springboks' rugby union tour of New Zealand. South Africa suffer their first ever test series loss against New Zealand. 1957 Australia wins the Rugby League World Cup. 1958 Rugby league's Cec Thompson becomes the first black manager of any sport in Britain. 1958 Great Britain defeat Australia 25–18 in the second rugby league test match with only eight fit players on the pitch. Alan Prescott plays for 77 minutes with a broken arm. 1960 Great Britain wins the Rugby League World Cup. The tournament is decided on a league system. 1964 Substitutes allowed in rugby league for the first time, but only for players injured before half-time. 1966 The Rugby League International Board introduces a rule that a team in possession is allowed three play-the-balls and on the fourth tackle a scrum is to be formed. The Southern hemisphere adopts the rule the following year, but it becomes six-tackle rugby in 1972, and in 1983 the scrum was replaced by a handover. 1967 Professional rugby league adopts Sunday as its main match day, in a bid to reverse declining attendances. 1968 Substitutes allowed in rugby union for the first time, but only for injured players. 1969 Springbok rugby union tour to Britain and Ireland. The tour is marked by protests against apartheid; South Africa would not tour the Home Nations again until after the end of apartheid. 1969 Rugby league finally gains recognition as a sport in British universities and colleges. 1970 Great Britain wins rugby league's Ashes in Australia, after winning the final two test matches. 1970 Rugby league's World Cup attracts poor crowds in England. Australia win. 1971 New Zealand wins a rugby league series in Britain for the first time since the original 1907–08 tour. 1971 Lions rugby union tour of Australia and New Zealand. This is the only Lions team to have won a test series in New Zealand. 1971 Springbok rugby union tour of Australia is marked by protests. 1972 Timekeepers and sirens were introduced into rugby league for first time. 1972 Great Britain regains the Rugby League World Cup in France. 1973 Rugby union's Barbarians defeat the All Blacks at Cardiff Arms Park. 1973 The British Amateur Rugby League Association sets itself up to run the sport at grassroots level after complaining of neglect by the RFL. Formal re-unification takes 30 years. 1974 Rugby union's Lions tour of South Africa. The notorious '99' call. 1975 Wales and England field separate teams in the Rugby League World Cup, played over several months in both hemispheres. Australia takes the trophy by finishing one point ahead of England in the final league table. 1976 New Zealand rugby union tour of South Africa. Twenty-eight nations boycott the 1976 Summer Olympics in protest against the International Olympic Committee's refusal to ban New Zealand from the games for defying the IOC's ban on sporting contact with South Africa. 1978 New Zealand rugby union tour of Britain and Ireland – New Zealand completes Grand Slam of victories over England, Ireland, Scotland and Wales for the first time. 1980 Australia establishes rugby league's State of Origin series, where Queensland and New South Wales born players face each other. From 1982 onwards, it is played as a three match series and is recognised as the fiercest, toughest rugby in the world. 1981 The ‘Sin Bin’ is introduced into rugby league, in Australia. 1981 Springbok rugby union tour of New Zealand. 1981 South Africa is banned by the International Rugby Board from international competition until such time as apartheid ended. 1982 Rugby union's Pacific Tri-Nations between Tonga, Fiji and Samoa. 1982 Australian rugby league tourists win all tour games for first time and become known as 'The Invincibles'. 1983 A rugby league try is increased to four points. The character of the game changes further with the introduction of the turn-over possession on the sixth tackle, drastically reducing the number of scrums. The Sin Bin is introduced for offences that do not merit a sending off. 1983 The Rugby League international transfer ban is lifted. 1984 Australia rugby union tour of Britain and Ireland — Australia completes the Grand Slam of victories over England, Ireland, Scotland and Wales for the first time. 1987 New Zealand Rugby Union defeats France 29–9 in the first Rugby Union World Cup, held in New Zealand and Australia. 1987 A "free gangway" between the two codes of rugby at amateur level is introduced, but individual cases of discrimination continues. 1987 The RFU introduces the Courage Leagues into Rugby Union — a league pyramid with roughly 1000 clubs playing in 108 leagues each with promotion and relegation. 1988 Rugby league's Wigan start their run of eight Challenge Cup final victories. The modern version of the Team of All the Talents, featuring players like Ellery Hanley, Andy Gregory, Jason Robinson and Shaun Edwards dominate for a decade, winning three World Cup titles in the process. 1989 Widnes beat Canberra 30–18 in first official World Club Challenge. 1990 Russia takes up rugby league. Russia goes on to appear in the 2000 World Cup and to enter club sides in the Challenge Cup. 1990 Blood-bin introduced into rugby league. 1990 The ban on French Rugby League using ‘rugby’ in its name is lifted. It changes its name back to Rugby à Treize. 1991 Australia defeat England 12–6 at Twickenham, London, in the second Rugby Union World Cup, held in the British Isles and France. 1992 The Springboks are readmitted to international rugby union. 1992 73,631 at Wembley see Australia defeat Great Britain 10–6 in the Rugby League World Cup final. 1994 David Hinchliffe MP introduces the Sports (Discrimination) Bill, to ban discrimination of amateur players of rugby league and other sports. 1994 The three British Armed Services recognises rugby league as a sport. Rugby league would be on the same footing as other sports in the Services. 1995 The International Rugby Board declares Rugby Union an 'open' professional game. It removes all restrictions on payments or benefits to those connected with the game. 1995 South Africa defeats New Zealand 15–12 (after extra time) at Ellis Park, Johannesburg in the third Rugby Union World Cup, held in South Africa. 1995 Rugby League centenary is celebrated by reviving the World Cup in Britain. Australia beat England 16–8 in the final at Wembley. Fiji, Tonga, South Africa and Western Samoa join the established nations in a successful tournament, whilst Ireland, Scotland, the US, Russia, the Cook Islands, Moldova and Morocco all compete in an Emerging Nations Tournament. 1995 The Heineken Cup is formed as a competition for 12 Rugby Union European clubs. 1995 As part of the struggle for television rights in Australia, the RFL in Britain is offered £87 million by News Corporation to set up rugby league's Super League. The game agrees to switch to a summer season, with Paris St Germain joining leading British clubs in a 14 team competition. 1996 The RFL introduces video referees into rugby league's Super League. 1996 Rugby union's Tri Nations Series begins between Australia, New Zealand and South Africa. 1996 Bath Rugby and Wigan, England's top union and league sides respectively, made history by playing against each other at both codes of rugby. The first match was at Maine Road, Manchester under league rules, Wigan beating Bath 82–6; then two weeks later the return match was held at Twickenham under union rules, Bath 44 beating Wigan 19. 1997 In Australia, the Super League war came to an end, with News International and the Australian Rugby League agreeing to merge their competitions to create the National Rugby League. 1998 Rugby sevens at the Commonwealth Games and Asian Games commences. 1999 IRB Sevens World Series commences. 1999 Australia defeat France 35–12 at the Millennium Stadium, Cardiff in the fourth rugby union World Cup, held in Wales with matches also being played in England, Scotland, Ireland and France. 2000 The IRB introduces the ‘Sin Bin’ into international rugby union, after being trialled on the domestic stage within the southern hemisphere's Super 12 competition. 2000 The IRB introduces the "Television Match Official" (TMO) into international rugby union, after being trialled on the domestic stage within the southern hemisphere's Super 12 competition. 2000 Rugby union's Courage League is replaced by the Zurich Premiership. 2000 Rugby union's Five Nations becomes the Six Nations Championship, when Italy joins. 2000 New Zealand narrowly defeats Australia at Stadium Australia (Sydney) in rugby union, in front of 109,874 spectators, a world-record crowd for either code. 2001 Lions rugby union tour of Australia. The Wallabies defeat the Lions in a series for the first time ever. 2003 Rugby union's Churchill Cup commences with Canada, the US, and England Saxons (England "A") as permanent participants and one invited team (later three). 2003 England defeat Australia 20–17 (after extra time) at Stadium Australia, Sydney in the fifth Rugby Union World Cup, held in Australia. 2003 The Rugby League European Federation (RLEF) is created to promote the sport across Europe. 2006 French team Catalans Dragons are granted a rugby league Super League licence. 2007 South Africa defeat England 15–6 at Stade de France, in the sixth rugby union World Cup, held in France with matches also being played in Scotland and Wales. 2008 Rugby league holds its first World Cup since 2000, with New Zealand defeating Australia in Brisbane by a score of 34–20 in the final to take their first Rugby League World Cup. 2011 New Zealand defeat France 8–7 at Eden Park, Auckland, in the seventh rugby union World Cup, held in New Zealand. 2011 14 teams qualify for the 2013 Rugby League World Cup: Australia, England, New Zealand, Samoa, Wales, Fiji, France, Papua New Guinea, Ireland, Scotland, Tonga, Cook Islands, Italy and United States of America. 2012 The Tri-Nations series is expanded to include Argentina, and is renamed The Rugby Championship. 2015 New Zealand defeat Australia 34–17 at Twickenham Stadium, England, in the eighth rugby union World Cup, held in the United Kingdom. In doing so, New Zealand becomes the first team to win consecutive titles. 2016 Inaugural season of PRO Rugby in the United States. The competition folded after just one season. 2016 Rugby sevens at the Olympic Games commences. 2017 Toronto Wolfpack become the first fully professional rugby team in Canada, joining the British/French professional rugby league system in the third tier League 1. Rugby union is both a professional and amateur game, and is dominated by the first tier unions: New Zealand, Ireland, Wales, England, South Africa, Australia, Argentina, Scotland, Italy and France. Second and third tier unions include Belgium, Brazil, Canada, Chile, Fiji, Georgia, Germany, Hong Kong, Japan, Kenya, Namibia, the Netherlands, Portugal, Romania, Russia, Samoa, Spain, Tonga, the United States and Uruguay. Rugby Union is administered by World Rugby (WR), whose headquarters are located in Dublin, Ireland. It is the national sport in New Zealand, Wales, Fiji, Samoa, Tonga, Georgia and Madagascar, and is the most popular form of rugby globally. The Olympic Games have admitted the seven-a-side version of the game, known as Rugby sevens, into the programme from Rio de Janeiro in 2016 onwards. There was a possibility sevens would be a demonstration sport at the 2012 London Olympics but many sports including sevens were dropped. In Canada and the United States, rugby union evolved into gridiron football. During the late 1800s (and even the early 1900s), the two forms of the game were very similar (to the point where the United States was able to win the gold medal for rugby union at the 1924 Summer Olympics), but numerous rule changes have differentiated the gridiron-based game from its rugby counterpart, introduced by Walter Camp in the United States and John Thrift Meldrum Burnside in Canada. Among unique features of the North American game are the separation of play into downs instead of releasing the ball immediately upon tackling, the requirement that the team with the ball set into a set formation for at least one second before resuming play after a tackle (and the allowance of up to 40 seconds to do so), the allowance for one forward pass from behind the site of the last tackle on each down, the evolution of hard plastic equipment (particularly the football helmet and shoulder pads), a smaller and pointier ball that is favorable to being passed but makes drop kicks impractical, a generally smaller and narrower field measured in customary units instead of metric (in some variants of the American game a field can be as short as 50 yards between end zones), and a distinctive field (shaped like a gridiron, from which the code's nickname is derived) with lines marked in five-yard intervals. Rugby league is also both a professional and amateur game, administered on a global level by the Rugby League International Federation. In addition to amateur and semi-professional competitions in the United States, Russia, Lebanon, Serbia, Europe and Australasia, there are two major professional competitions—the Australasian National Rugby League and the Super League. International Rugby League is dominated by Australia, England and New Zealand. In Papua New Guinea it is the national sport. Other nations from the South Pacific and Europe also play in the Pacific Cup and European Cup respectively. Distinctive features common to both rugby codes include the oval ball and throwing the ball forward is not allowed so that players can gain ground only by running with the ball or by kicking it. As the sport of rugby league moved further away from its union counterpart, rule changes were implemented with the aim of making a faster-paced and more try-oriented game. Union players contest possession following the tackle: depending on the situation, either a ruck or a maul can occur. League players may not contest possession after making a tackle: play is continued with a play-the-ball. In league, if the team in possession fails to score before a set of six tackles, it surrenders possession. Union has no six-tackle rule; a team can keep the ball for an unlimited number of tackles before scoring as long as it maintains possession and does not commit an offence. Set pieces of the union code include the "scrum", in which packs of opposing players push against each other for possession, and the "line-out", in which parallel lines of players from each team, arranged perpendicular to the touch-line, attempt to catch the ball thrown from touch. A rule has been added to line-outs which allows the jumper to be pulled down once a players' feet are on the ground. In the league code, the scrum still exists, but with greatly reduced importance as it involves fewer players and is rarely contested. Set pieces are generally started from the play-the-ball situation. Many of the rugby league positions have similar names and requirements to rugby union positions, but there are no flankers in rugby league. In England, rugby union is widely regarded as an "establishment" sport, played mostly by members of the upper and middle classes. For example, many pupils at public schools and grammar schools play rugby union, although the game (which had a long history of being played at state schools until the 1980s) is becoming increasingly popular in comprehensive schools. Despite this stereotype, the game, particularly in the West Country is popular amongst all classes. In contrast, rugby league has traditionally been seen as a working-class pursuit. Another exception to rugby union's upper-class stereotype is in Wales, where it has been traditionally associated with small village teams made up of coal miners and other industrial workers who played on their days off. In Ireland, both rugby union and rugby league are unifying forces across the national and sectarian divide, with the Ireland international teams representing both political entities. In Australia, support for both codes is concentrated in New South Wales, Queensland and the Australian Capital Territory. The same perceived class barrier as exists between the two games in England also occurs in these states, fostered by rugby union's prominence and support at private schools. Exceptions to the above include New Zealand (although rugby league is still considered to be a lower class game by many or a game for 'westies' referring to lower class western suburbs of Auckland and more recently, southern Auckland where the game is also popular), Wales, France (except Paris), Cornwall, Gloucestershire, Somerset, Scottish Borders, County Limerick (see Munster) and the Pacific Islands, where rugby union is popular in working class communities. Nevertheless, rugby league is perceived as the game of the working-class people in northern England and in the Australian states of New South Wales and Queensland. In the United Kingdom, rugby union fans sometimes used the term "rugger" as an alternative name for the sport, (see Oxford '-er'), although this archaic expression has not had currency since the 1950s or earlier. New Zealanders refer to rugby union simply as either "rugby" or "union", or even simply "football", and to rugby league as "rugby league" or "league". In the U.S., people who play rugby are sometimes called "ruggers", a term little used elsewhere except facetiously. In France, rugby is widely played and has a strong tradition in the Basque, Occitan and Catalan areas along the border regions between Spain and France. The game is very popular in South Africa, having been introduced by English-speaking settlers in the 19th century. British colonists also brought the game with them to Australia and New Zealand, where the game is widely played. It has spread thence to much of Polynesia, having particularly strong followings in Fiji, Samoa, and Tonga. Rugby union continues to grow in the Americas and parts of Asia as well. A rugby ball, originally called a quanco, is a diamond shape ball used for easier passing. Richard Lindon and Bernardo Solano started making balls for Rugby school out of hand stitched, four-panel, leather casings and pigs’ bladders. The rugby ball's distinctive shape is supposedly due to the pig's bladder, although early balls were more plumb-shape than oval. The balls varied in size in the beginning depending upon how large the pig's bladder was. 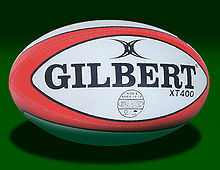 In rugby union, World Rugby regulates the size and shape of the ball under Law 2 (also known as Law E.R.B); an official rugby union ball is oval and made of four panels, has a length in-line of 280–300 millimetres, a circumference (end to end) of 740–770 millimetres, and a circumference (in width) of 580–620 millimetres. It is made of leather or suitable synthetic material and may be treated to make it water resistant and easier to grip. The rugby ball may not weigh more than 460 grams or less than 410 and has an air pressure of 65.71–68.75 kilopascals, or 0.67–0.70 kilograms per square centimetre, or 9.5–10.0 lbs per square inch. Spare balls are allowed under the condition that players or teams do not seek an advantage by changing the ball. Smaller sized balls may also be used in games between younger players. Much larger versions of traditional balls are also available for purchase, but these are mainly for their novelty attraction. The Rugby World Cup, which was first held in New Zealand and Australia in 1987, occurs every four years. It is an international tournament organized by World Rugby. The event is played in the union format and features the top 20 teams from around the world. The current world champions are New Zealand, who won the 2015 Rugby World Cup, which was played in England. The Rugby League World Cup was the first World Cup of either of the Rugby codes and was first held in France in 1954, and as of 2013 occurs on a 4-year cycle. It is an international tournament that is organized by the Rugby League International Federation. The event is played in the league format and features the top 14 teams from around the world. The current world champions are Australia, who won the World Cup in 2013, played in England, Wales, France, and Ireland. Rugby shirts were formerly made of cotton but are now made of a cotton and polyester mix. This material has the advantage of not absorbing as much water or mud as cotton alone. Owing to the more aggressive nature of the game, rugby clothing, in general, is designed to be much more robust and hardwearing than that worn for association football. The rugby jerseys are slightly different depending on the type of rugby game played. The shirts worn by rugby league footballers commonly have a large "V" around the neck. The players in rugby union wear jerseys with a more traditional design, sometimes completely white (Cahors Rugby in France). The number of the player and his or her surname are placed on the upper back of the jersey (often name above number, with the number being significantly larger and more central), and the logo of the team on the upper left chest. Like most team sports, both forms of rugby are vulnerable to match-fixing, particularly bets involving easily manipulated outcomes, such as conceding penalties and first point scorer. A recent example is a deliberate infringement by Ryan Tandy in order for the first points scored to be a penalty goal in a 2010 NRL match; the attempt backfired when instead of taking a shot at goal, a try was scored. ^ "The Rugby World Cup: Second Only To The Soccer World Cup in Attendance [Infographic]". Forbes. 18 September 2015. ^ "Rugby League World Cup:Will World Cup joy finally come for Sam Burgess?". BBC Sport. 30 November 2017. ^ "The Other (and Less Popular) Rugby World Cup Gets Underway". New York Times. 27 October 2017. ^ "Broken Time -review". The Guardian. 2 October 2011. ^ "27 August 1995:Rugby Union turns professional". MoneyWeek. 27 August 2015. ^ Gilbert, Ian (10 October 2003). "The bluffer's guide". Archived from Age%5d%5d the original Check |url= value (help) on 15 July 2013. ^ The New Encyclopædia Britannica, 2007 Edition: "In ancient Greece a game with elements of football, episkuros, or harpaston, was played, and it had migrated to Rome as harpastum by the 2nd century BC". ^ Baker, Andrew (20 August 1995). "100 years of rugby league: From the great divide to the Super era". The Independent. independent.co.uk. Retrieved 25 September 2009. ^ Tony Collins (2006). "Schism 1893–1895". Rugby's great split: class, culture and the origins of rugby league football (2nd ed.). Routlage. pp. 87–120. ISBN 0-415-39616-6. ^ Laws of Football as played at Rugby School (1845) – via Wikisource. ^ "National football". The Age. Melbourne, VIC. 17 April 1915. p. 12. ^ "Annual meeting of the league – the proposed universal code". The Mercury. Hobart, TAS. 30 March 1915. p. 8. ^ Kemp, Stuart (24 August 2007). "Rugby World Cup gaining wide popularity". Reuters. Retrieved 30 May 2011. ^ "International Rugby Board – News". Irb.com. Archived from the original on 3 January 2010. Retrieved 30 May 2011. ^ Michaelis, Vicki (8 July 2005). "Baseball, softball bumped from Olympics". USA Today. Retrieved 17 August 2008. ^ "PNG vow to upset World Cup odds". Rugby League. Federación Peruana de Frontón. 15 October 2008. Retrieved 3 July 2009. But it would still be one of the biggest shocks in World Cup history if Papua New Guinea – the only country to have rugby league as its national sport – were to qualify for the last four. ^ "PNG seal 2010 Four Nations place". BBC. 1 November 2009. ^ Sommerville, D. (1997). The Encyclopedia of Rugby Union. Aurum Press, UK. ISBN 1-85410-481-0. ^ a b Collins, T. (2005). "Australian Nationalism and Working-Class Britishness: The Case of Rugby League Football." History Compass, Vol. 3, No. 1. ^ Collins, T. (1998). Rugby’s Great Split: Class, Culture and the Origins of Rugby League Football (London). OED: Rugger "Slang or colloquial alteration of RUGBY (in the sense of 'Rugby football'). Freq. attrib. rugger-tackle". Tony Collins, Football, rugby, rugger?, BBC sound recording with written transcript, and a comment in prose by Jonnie Robinson, Curator, English accents and dialects, British Library Sound Archive. ^ The New Zealand Pocket Oxford Dictionary. ISBN 0-19-558379-5. ^ International rugby board. "Rugby ball laws" 22 Feb. 2010.